The second day of TED 2016 was a long one. I left my hotel before 8:00am and did not return until after 7:00pm. There were 4 sessions of 1 hour and 45 minutes each. Each session had between 6 and 8 speakers around some sort of general theme. There were no absolutely amazing talks, but lots of solid ones. To me, what made some of the talks memorable was the passion the presenters had for their work. As many of them were passionate about areas I'm interested in, I found the talks enjoyable, but not ones that inspired me to any particular course of action. Cedric Villani was passionate about mathematics. He won the Fields Medal (sort of the Nobel prize for mathematicians) and sees math in everything. He is French and said that most people think the French are famous for "love, wine, and whining." To that, he would add mathematics. His flamboyant clothes (including a purple cravat and a large silver spider his lapel) and his long hair accented his desire to be different and see the world differently. He said that mathematics "allow us to go beyond intuition." Haley Van Dyck was passionate about her work of dragging the US government's computer technology into the 21st Century. She recounted how when she started work in 2008, she was given a laptop running Windows 98. She cited how the government spends $86B on IT projects of which 94% are over budget or late and 40% never will see the light of day. Her organization, the US Digital Service, is attempting to change that. While I'm skeptical, I hope her enthusiasm can last long enough to make a real impact. One of the passionate presenters was Franz Freudenthal, a doctor from La Paz, Bolivia. He developed a treatment for babies with a particular congenital heart defect. This problem is both more prevalent at high altitudes (La Paz is over 12,000 feet high) and more severe (a larger hole). Open heart surgery to repair the problem is prohibitively expensive in a poor country like Bolivia. He developed a device and technique for closing the hole in the heart that can be done in 30 minutes and delivered via the patient's arteries. The pictures of Bolivia and the children there made me feel homesick for Cochabamba. I made a point of talking to him after the session and he and his wife were obviously passionate about their work. He gave me his card and told me told contact him the next time I'm in Bolivia. It is truly a small world. The last talk of the day was by the 2016 TED Prize winner, Sarah Parcak. She could not contain her enthusiasm for her work in archaeology. I admit that I am a big fan of archaeology and have long hoped to spend time at a dig in Israel some day. Hearing her talk made me want to jump on the next plane and go. Her TED Prize wish is to use satellite imagery and crowd sourcing to decrease the amount of looting at archaeological sites in Egypt and around the world. While I'm skeptical she can succeed, I sure hope she can. And, with her passion for archaeology, maybe she can. Regardless, I think I need to try and schedule my trip to a dig before too long. There were many other interesting talks including back-to-back fun ones by Tim Urban and Adam Grant looking at avoiding procrastination (Urban) and the correlation between procrastination and creativity (Grant). I think that means that I must be creative! Brian Little gave a compelling and fun talk about the science of personality and how we can use it to improve ourselves. It made me buy his book, Me, Myself and Us. An interview with 93-year-old Norman Lear was very enjoyable and gave me hope that it is possible to reach old age gracefully, creatively, and with something to contribute to others. I enjoyed the music, particularly that of the Silk Road Ensemble. Years ago I found an album I rather liked (Silk Road Journeys) by them with Yo-Yo Ma. They perform an interesting fusion of Western and Eastern music and instruments. Rhiannon Giddens joined them and her voice blew me away. 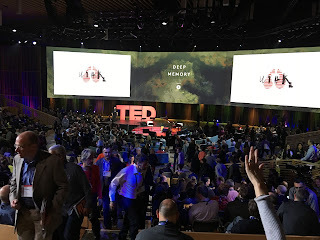 The food at TED is an odd combination of really trendy (pretty much everything has kale in it), somewhat confusing (double chocolate quinoa snacks), and ever present (between every session there is food out). 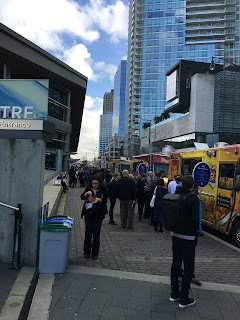 Lunch was food trucks that had all sorts of trendy, confusing choices. Fortunately, we found one serving burgers and fries. One difference between TED and TED Active is the presence of celebrities here. I'm used to being around tech celebrities, but not ones from other realms. I was walking into a session and heard a familiar voice. I glanced at the person next to me and it was Al Gore. Meg Ryan ate lunch at the table next to ours. Goldie Hawn was looking over the same odd assortment of snacks we were. People generally make no fuss about them and I've tried to do the same. Still, it is hard to not steal a glance or two.